This week SoxProspects.com Editor-in-Chief Mike Andrews began his five-part series on ESPNBoston examining the depth in the farm system position-by-position. Naturally he begins the series by looking at an area that has gotten plenty of attention this spring, the starting pitching. The Dodgers trade was really the highlight of the difficult 2012 season for the Red Sox, and thus it is no surprise Allen Webster and Rubby De La Rosa (pictured) are players the media and fans are keying in on. Webster saw the mound twice this past week. In his first outing, the 24-year-old impressed manager John Farrell, who believes even the umpires were impressed, after hitting 99 mph and striking out two in his three shutout innings, as WEEI.com's Alex Speier writes. Speier also wrote about Webster's most recent outing in which he went three innings with one earned run and five strikeouts, noting that his secondary offerings remind at least one scout of another current Red Sox starter. De La Rosa did not pitch after being acquired by the Red Sox last year so his appearances have opened some eyes as well. He also made two appearances this week, going two innings each time and showing all three of his pitches, including a fastball that sat 94-96 mph. He only allowed one hit in the first game, but had a harder time in the second appearance, allowing two runs on three hits. Speier writes about his impressive performance while upstaging Jon Lester, while Brian McPherson of the Providence Journal writes about how De La Rosa's still a work in progress. Other writers look at the pitchers together and what that trade has meant to the Red Sox future. Speier writes how the trade could transform the Red Sox future, and the Boston Herald's John Tomase writes that the duo's performance has proven last year's trade with the Dodgers was more than a pure salary dump. Jackie Bradley Jr. continues to impress, not just on the field, but off, as the 22-year-old is earning admiration from his teammates and coaches, and was even compared with a three-time All-Star, writes Ian Browne of MLB.com. In attempts to solidify his offensive game, Jose Iglesias ditched the glove during the offseason in favor of his bat, as John Tomase of the Boston Herald notes. The extra offensive effort has paid off thus far this spring, as Iglesias has collected six hits in 20 at bats -- including three doubles and one home run. His defense has been MLB-ready for a while now and development with the bat is what will determine his future in the big leagues. In the coming weeks, Bryce Brentz will take the field for the first time this spring, according to Alex Speier. The 24-year-old has been out of camp mending a self-inflicted gunshot wound to his leg. Brentz was not the only Red Sox prospect who had an accident this spring. Left-handed pitcher Drake Britton, was arrested for driving under the influence over the weekend. He was scheduled to start on Sunday, but instead was optioned to Double-A Portland on Monday. Prior to the arrest, Britton had pitched three and 1/3 innings in two games this spring, allowing three runs and five hits while walking four. Ryan Westmoreland, who made it as high as second on the SoxProspects.com rankings during his brief time in the Red Sox system, announced his retirement this week. Brian McPherson relays the reaction of many of the Red Sox players, coaches, front office staff, and those close to Westmoreland to the news. The Rhode Island native is truly an inspiration, and will continue to be an inspiration for one Red Sox, writes ESPNBoston.com’s Joe McDonald. 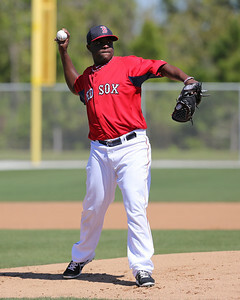 SoxProspects.com has received word that right-handed pitcher Andrew Jones has retired as well. 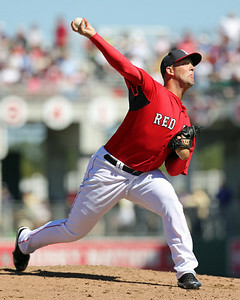 After closing at Samford University, he was signed by the Red Sox in June of 2011. He appeared for the GCL Red Sox, Lowell Spinners, Greenville Drive, and Salem Red Sox, making 58 appearances during his two-year professional career. McPherson also wrote about another local kid, New England's' Terry Doyle (pictured), who now has an opportunity to impact the team he grew up rooting for after signing with the Red Sox this winter following a stint pitching in Japan. Amateur scouting is often difficult, especially when trying to figure out if high school players prefer to turn pro or go to college. McPherson notes that sometimes it requires teams and its scouts to try to read minds as shown through the recruitment of right-hander Jamie Callahan. Two former members of the Red Sox system are having early success with the clubs that selected them in this winter’s Rule 5 draft. Ryan Pressely has yet to surrender a run for the Minnesota Twins in seven innings of work with three hits and one walk allowed. Josh Fields has struck out three and has yet to yield a hit in 3 1/3 innings of work for the Houston Astros, but he has walked three batters. SoxProspects.com's Director of Scouting keeps pumping out his Prospect Previews. Find them all here, including the two from this week, the first on Travis Shaw and Christian Vazquez and the second on bats you should have on your watch-list. Will Woodward and Kevin Pereira are Staff Writers for SoxProspects.com. Follow Will on Twitter @SPWill and Kevin @kevinrpereira.